When you’re drawing daily cards, or as in the case of this challenge, you do long and complex spreads every two days or so, it’s impossible not to get a stalker or two. Maybe even more. Stalker cards are those cards that come up repeatedly in your readings, regardless of whom you read for: yourself, or someone else. There are two ways in which you can view stalker cards: 1) if you keep reading on the same question and get the same cards, then what the tarot is trying to say is that it gave you the message already and it’s just repeating itself, which means you need to step away from that particular question and allow yourself time to work on the problem, and 2) if you read on different topics or for different people, and the readings are not related, then your stalker cards represent your intuition and your subconscious mind trying to tell you something, trying to push a message that’s still eluding you. Personally, I like to see stalker cards as holding deeper meanings that I have yet to understand. For example, one of mine is the Nine of Swords. Not a happy card. Not even close! I know that it means anxiety, worries, stress, waking up in the middle of the night because you feel too overwhelmed to rest. But what if it holds an even deeper meaning for me? If I meditate on it and try to see all the ways in which it describes me and the way my mind works, what else might I discover? 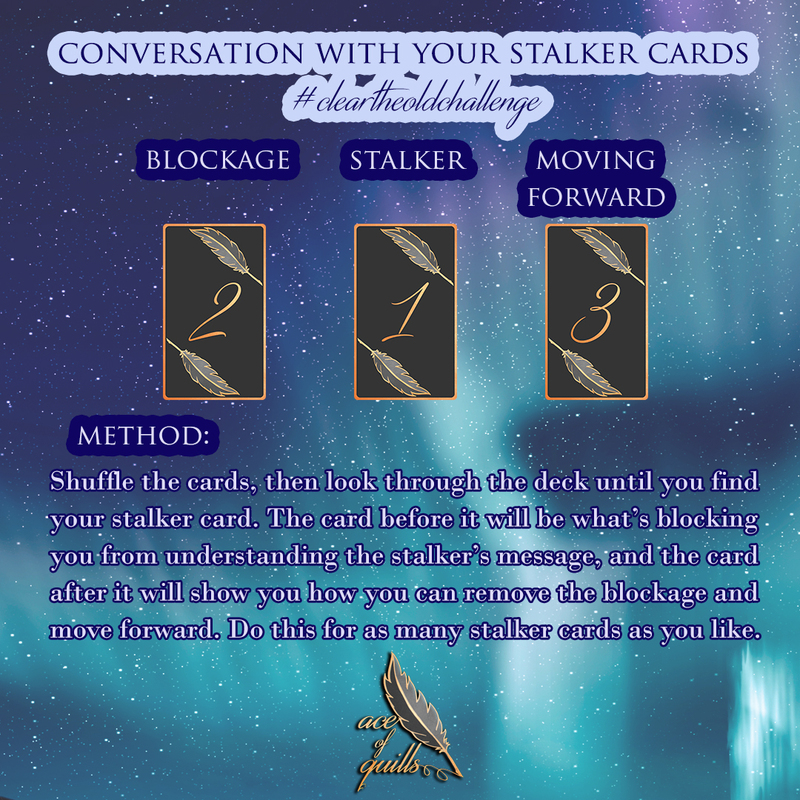 • when you find it, look at the cards positioned before it and after it: the one before represents what’s blocking you from understanding the message of your stalker, and the one after shows you how to remove the blockage and move on. Easy, right? Do this with as many stalker cards as you want.